Calvin Harris has been ranked one of the wealthiest young stars in the music world with a fortune estimated at £30 million. He is second only to pop queen Adele - who has seen her fortune swell by around 50 per cent in a year when she released no new material - who tops the Sunday Times Rich List's countdown of the biggest financial successes in the music world aged 30 and under. Superstar DJ Calvin has had a string of major hits with nine top singles from his latest album 18 Months and has worked with acts such as Cheryl Cole, Rihanna and LMFAO. Last year he was named songwriter of the year at the Ivor Novello Awards. The former shelf-stacker - whose real name is Adam Richard Wiles and who is dating Rita Ora - is said to be able to command £100,000 for a night's work as a DJ in Las Vegas. Cheryl, who has recently signed up for a return to The X Factor panel, drops to third place from last year's number two although she has banked a further £2 million, according to the compiler of the list, Philip Beresford. The five members of One Direction take joint fourth place with an estimated £14 million each, although they have a combined fortune of £70 million. Niall Horan, Zayn Malik, Harry Styles, Louis Tomlinson and Liam Payne are thought to have seen their finances swell by £9 million in the past 12 months, which has seen them tour, release a movie and a third album. Their inclusion in the upper reaches of the list - along with Mumford And Sons frontman Marcus Mumford and his wife Carey Mulligan, together worth £13 million - has edged out regular faces such as Katie Melua and Charlotte Church. Katie has slipped from last year's joint-third spot to number 11, while Charlotte drops from sixth to 15th place. Young entrepreneur Jamal Edwards, 23, has made it to number 15 with his £8 million fortune amassed from his broadcasting and production company SB.TV which emerged from the grime and hip-hop scene. The full Rich List is published in this weekend's edition of The Sunday Times. Sir Paul McCartney has teamed up with the team behind War Horse who have created a robot for his latest video and live shows. Robin Thicke will apparently be making a bid to win back wife Paula Patton by performing a song about her at the Billboard Music Awards. Justin Timberlake has been given an opportunity to dance alongside Michael Jackson in a new music video. Andrew Lloyd Webber has suggested his West End show Stephen Ward closed within a few months because the public are only interested in "feel good" musicals. Ludacris is to host the 2014 Billboard Music Awards. Beyonce and Jay Z have added more dates to their On The Run summer concert tour. 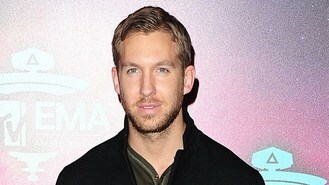 Calvin Harris could be set to extend his Las Vegas residency. Pharrell Williams has confessed he has a tendency to "over think it" when he's producing his own music. Miley Cyrus has denied that comments she made about an ex at a live show were directed at Liam Hemsworth.